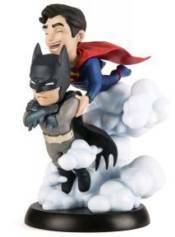 Superman shares the joy of flight with his very best friend, Batman, who is having none of it in the latest Q-Fig Max figure. The complex relationship between the Last Son of Krypton and the Dark Knight of Gotham is summed up in this charming diorama inspired by the Rebirth versions of the characters. An ingenious cloud base allows for Superman to fly while Batman dangles in his grip. Batman frowns at the thought of being transported by his super friend while Superman chatters on unaware of Batmans irritation.